Deserts are defined by low average annual rainfall — usually 100 millimeters (less than 4 inches) of rain per year or less. 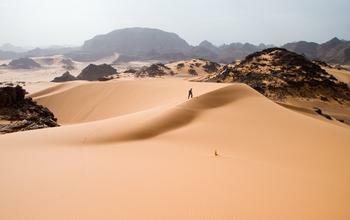 The researchers analyzed annual rainfall data recorded throughout Africa from 1920 to 2013 and found that the Sahara, which occupies much of the northern part of the continent, expanded by 10 percent during this period. "We've already started looking at seasonal temperature trends over North America, for example. Here, winters are getting warmer but summers are about the same. In Africa, it's the opposite — winters are holding steady but summers are getting warmer. So the stresses in Africa are already more severe."